A pronoun is a word that replaces a noun in a sentence, making the subject a person or a thing. 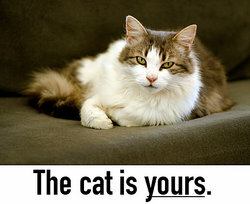 Possessive pronouns are pronouns that demonstrate ownership, showing that something belongs to a particular someone. Like other pronouns, they're great for brevity and for avoiding repetition. Possessive pronouns include my, mine, our, ours, its, his, her, hers, their, theirs, your and yours. These are all words that demonstrate ownership. If the book belongs to me, then it is mine. If the book belongs to her, then it is hers. The kids are yours and mine. The house is theirs and its paint is flaking. The money was really theirs for the taking. We shall finally have what is rightfully ours. Their mother gets along well with yours. What's mine is yours, my friend. The basic sentences above demonstrate how possessive pronouns can be used in sentences. However, one thing that can be confusing is the use of possessive adjectives with gerunds. A gerund is a word that started out as a verb, but with the addition of -ing at the end, they can function as a noun. I couldn't take him griping anymore. I couldn't take his griping anymore. Here are a few more examples where the possessive pronoun is combined with a gerund. Your taking the prize was a nice surprise. The children make their beds without my asking them to. I so appreciated his helping out. Her coming to us was the right thing to do. I appreciate your understanding of the matter. I feel bad at his missing this opportunity. Their mocking of him was inappropriate. I loved listening to his singing. These examples help to illustrate not only what possessive pronouns are, but also how they can be used to make a sentence clearer. Avoiding ambiguity is important in effective writing. Possessive pronouns are essential for writing and communication, so the reader or listener knows to whom an item belongs. To learn more about possessive pronouns see What Is a Possessive Pronoun? "Examples of Possessive Pronouns." YourDictionary, n.d. Web. 18 April 2019. <https://examples.yourdictionary.com/examples-of-possessive-pronouns.html>.